Awareness t-shirts raise money, that’s a fact. They are a low cost item with a lot of room to build in profit, or in the case of awareness, funds for fundraising. With custom t-shirts the more shirts you buy the lower the cost each shirt becomes. As a result the more shirts you sell the more profit margin you have and the more funds you end up raising. Cancer, lupus, ALS, autism, and all the other various realities of today are just that, real life. For anyone who has experienced any of these you know support is of the utmost importance in getting someone through a difficult time. It’s also a reality that research, treatment, and day to day life can become costly. So we host fundraisers and raise money because that is how to help someone financially with a collaborative effort known as support. Custom awareness t-shirts raise money because they work two fold. They are a low cost product that can be customized to fit each fundraising need and can be priced to sell giving you healthy margin. As a result these custom printed t-shirts raise awareness when people where them. They show your support and let people know this is happening. 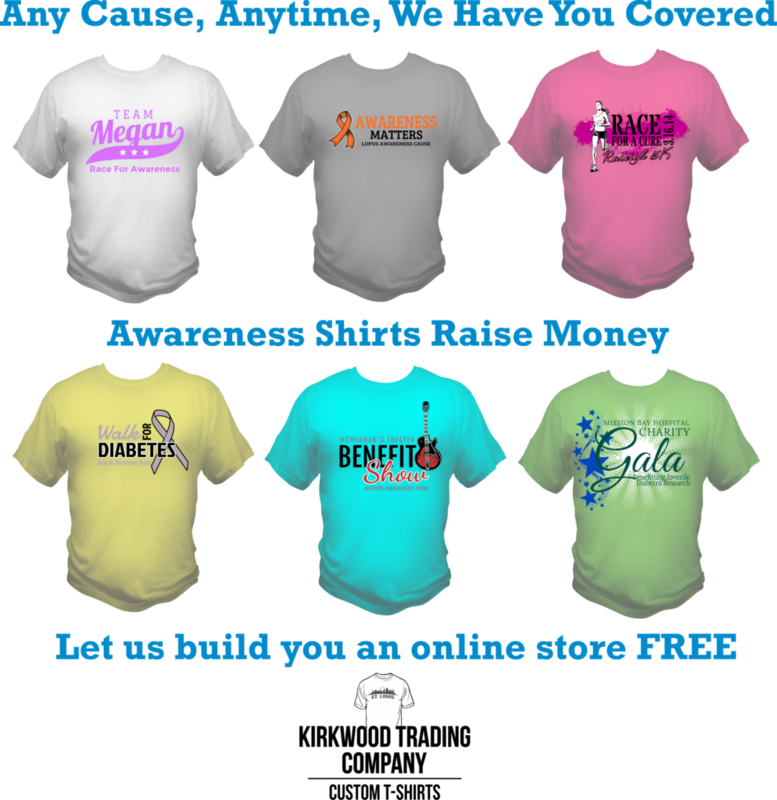 Kirkwood Trading Company takes awareness shirts to another level for our customers. We offer our customers a free online custom store for them to sell their shirts. These stores are 100% free. We build the store, we run the store as far as taking payments, bagging orders and shipping if need be. Since we provide our customers an online presence they are already able to reach more people in a more convenient manner. Most people now days prefer to buy online and with a custom awareness fundraising store, you are giving people their preference to buy. That’s not to say we can’t print a few hundred shirts to sell at your trivia night. We print shirts based on how you need them. The online stores is just a way we can help more people both near and far. Awareness t-shirts raise money, and we print awareness t-shirts. We are hear to help you raise money for your cause. Contact us to learn more.